Replacement bottom dual coil heads for the Innokin iClear16BDC. Available in 1.5 and 2.1 ohms. I was looking for a good vape without that ugly Burnt taste. So I asked what I could use besides a single coil. I was told to try the Dual coil since I like the 100% vg juice. The wicks do stay moist but I still get that burnt taste sometimes. So I have to give this part 3 stars. But definitely better.I chose the 2.1ohm resistance. 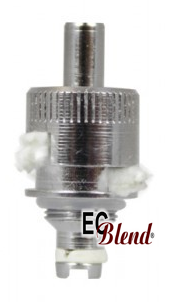 Click the button below to add the Clearomizer Replacement Head - Innokin - iClear16BDC - Dual Coil to your wish list.